Southern Culture on the Skids – On tour now! I saw these guys a couple of years ago in a now defunct local dive (Revolution Hall – Troy, NY) and really enjoyed the show. 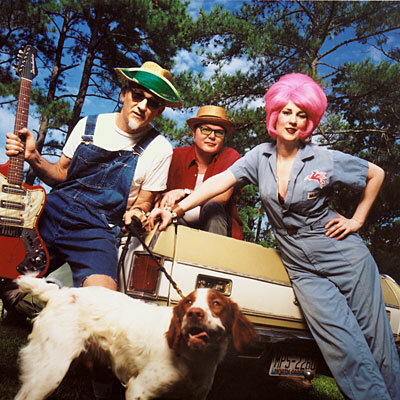 Southern Culture On The Skids (or SCOTS for short) is basically rockabilly meets country meets B-52’s meets something entirely unique unto itself. The band has announced some new tour dates and sadly they are not coming to Albany once again this year. I find it amazing that so many bands overlook Albany (the capital city of New York for God’s sake! ), then again most people outside of the state think New York City is the capital. The band Midlake, who’s album I reviewed a few months back, just got back from a tour of Europe and played a few cities in the US. They only local appearance was 1.5 hours away in Syracuse …and they jumped right over Albany and went to Boston for the next gig, gee thanks! To be fair, Albany does get its share of good shows but many of the bands that I would like to see often jump right over my beloved city, bummer. If you are curious about seeing SCOTS on the road now’s the time; check the following dates and git’ yer’ tickets! On Monday I posted my second installment of Print o’ The Week and some have emailed me asking what the Midlake in the print meant; good question right? The print is actually concert poster created by Portland, Oregon artist Dan Stiles for a Midlake show in that city. But, clearly more of an explanation and album review of the band Midlake would be appropriate. I stumbled upon Midlake when I began to get interested in Iron and Wine; I had been a die hard Elliot Smith fan for years and the natural progression to these bands makes sense since to a degree they follow a similiar formula and would be catagorized in a similiar genre of music. In my opinion if you are familiar with the bands Dolorean, Kingsbury Manx, or Chatham County Line and like indie-folk-rock, you will also find Midlake appealing as well. 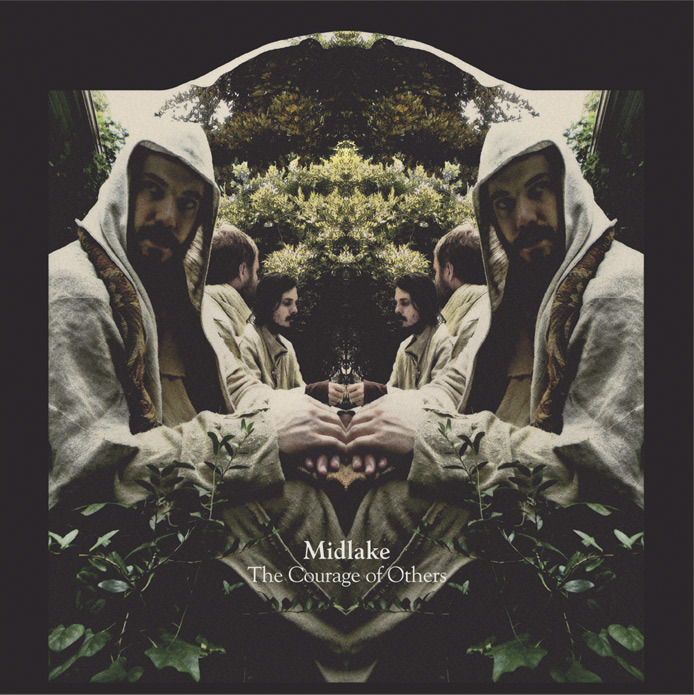 Midlake is not a new band by any means, they have actually been together since 2001 and have released 3 albums prior to The Courage of Others (2010). Midlake’s previous album Trials of Van Occupanther (2006) brought the most notoriety for the band; although remaining relatively an underground album it did gain them a larger loyal following. Mellow and serene, lying on your back on a sunny day staring at big puffy clouds and dreaming about life and what it all means would sum up what listening to Midlake is like. Lead singer Tim Smith has a Thom Yorke (Radiohead) quality to his singing, but defines himself with a lullaby quality that is complimented by the always apparent folky flute and piano balladesque indie-folk-r0ck tempos. The Courage of Others takes the band down a similiar path as Van Occupanther, however, there is a greater sense of sincerity in this album. The first song Acts of Man is a deeply moving, honest and just a simply fantastic arrangment highlighting the use of harmony that the band mastered and created as a signature of their music. Winter Dies starts off with a faster tempo that is quite unexpected and then regresses into a solid mellow mood that just continues to keep the album together. Songs like Small Mountain, Core of Nature, and Rulers, Ruling All Things exemplify Midlake‘s wholehearted and ernest attention to detail writing songs over the course of four years between albums. Like their songs, it is apparent that their work is not taken lightly and not rushed into with wreckless abandonment; clearly the band wants every album to be worthwhile to the one listening. Midlake’s music is consistently mellow, this is not rock album by any means. Midlake keeps the mood and tempo consistent throughout every song. That is not to say that Midlake’s music is monotonous or repetative, it’s not, however Midlake does keep to a pretty consistent formula never really straying one way or anothe. In many ways this album, and their previous releases, feel like a story and each song is a the next chapter. Midlake is not for everyone, for some they might find themselves absolutely bored to tears with this album; others might find it a true gem. Yet, as I mentioned earlier, if you do like mellow folky-indie sounding singers or bands you should like Midlake. They fall in between Nick Drake and Dolorean I guess. If you are able to pick up a copy of The Trials of Van Occupanther do yourself a favor and check it out as well, it is a landmark album for the band. Midlake is currently touring in Europe and I hope they swing back in the US for some dates. The band hails out of Texas, so I’m sure upon their return they will play there first. Check out Midlake’s website at www.midlake.net to hear a few songs in their entirety. You can also listen to a dozen or few samples of Midlake’s music from various albums by clicking here . The second installment of my “Print O’ The Week” posts is a print by artist Dan Stiles. 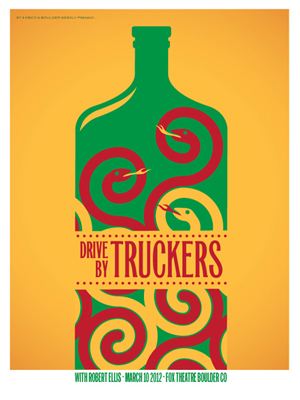 Dan is based out of Portland, Oregon and he comes up with some very cool, clever, and original designs for his prints. His website is fun and you will find a plethora of band prints to choose from; most are from shows in the Portland area where the bands played. 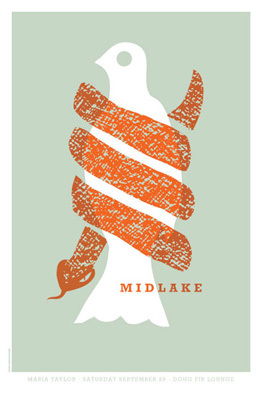 This print for the band Midlake I thought was eyecatching and very appealing…and hey, it’s a steal! A limited edition run of 90, signed by Dan and only $24! I think I might have to grab this one myself this afternoon. Tell us what you think of the print! Check out all the cool prints Dan Stiles has to offer by clicking here. Check out my May post entitled The “Art” of the Music Business to learn more about this cool medium.